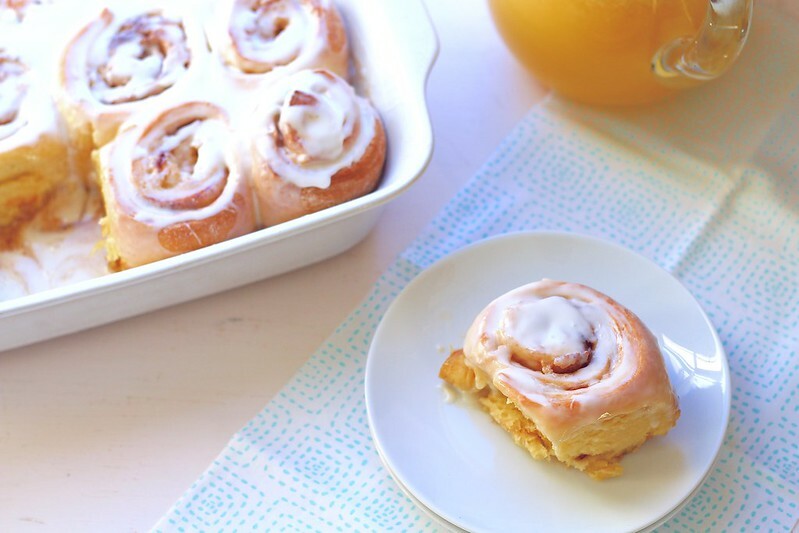 Cinnamon rolls are a favorite in our household, but I don't make them very often. They are more of a special treat thing. AKA, only when I actually feel like, or remember to put in the effort Saturday so we can have them Sunday morning. We had these cinnamon rolls for Christmas morning last year. It was perfect because I let them rise, filled them and sliced them all the day before. So, on Christmas morning, instead of getting up at the crack of dawn just to make cinnamon rolls to be sure they were done in time for breakfast, I got to spend time with the family, and cook the rest of breakfast with my husband. Perfection. 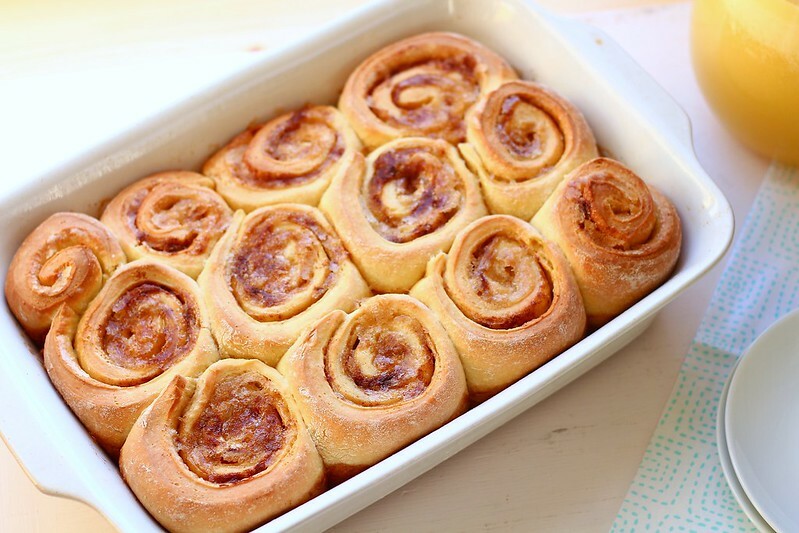 These rolls are made of a simple dough that is smooth and easy to work with. They are filled with a little butter, cinnamon and brown sugar. Then, they are topped with an easy confectioners' sugar glaze. All the work and rising is done the day before, they are set in the refrigerator to rise over night. The next morning, you take them out to warm up while the oven is preheating. After they bake, you smear frosting over the top and serve! And, if you want to freeze them, you can bake them, let them cool and then pop them in the freezer wrapped. 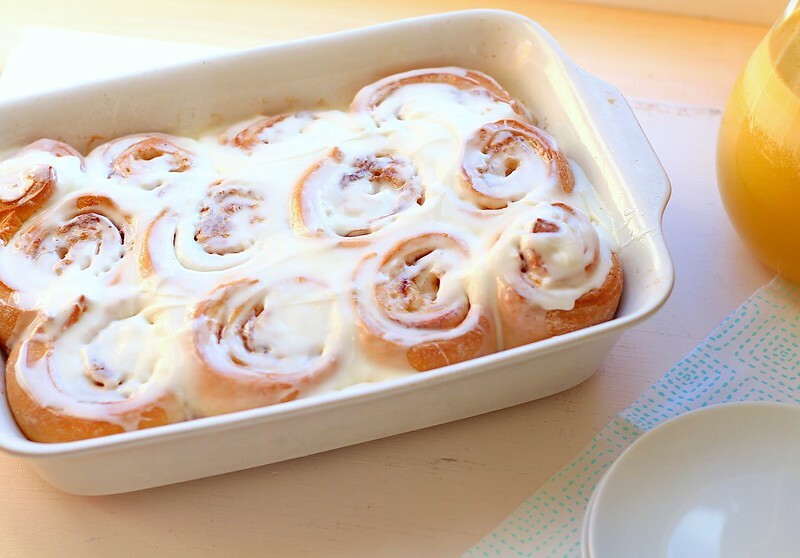 To serve, let thaw, and warm in the oven, then drizzle with frosting. Put some time aside this weekend because these are necessary! To make the dough, grease a large bowl and set aside. In the bowl of a stand mixer fitted with the paddle attachment, mix together the yolks, whole egg, sugar, butter, and buttermilk. Stir in 2 cups of flour, yeast and salt until evenly moistened. Switch to the dough hook and add the remaining 1 3/4 cups flour and knead on low speed for 5 to 7 minutes. The dough should be soft and moist, but not overly sticky. If the dough is sticky, mix in 1 tablespoon of flour at a time until the dough is soft. Scrape the dough into the prepared bowl, turning once, and cover with plastic wrap. Let dough rise at room temperature until doubled, about 2 to 2 1/2 hours. Once the dough has fully risen, grease a 9×13-inch baking dish. Turn the dough out onto a floured work surface and roll it into a rectangle that is about 18 inches wide and about 12 inches long, with the long side closest to you. Brush the dough with the melted butter. Sprinkle it evenly with the brown sugar, then the ground cinnamon. If you like a lot of cinnamon, add more to your liking. The next morning, before you are ready to bake, remove the rolls from the refrigerator 30 minutes before baking. Preheat your oven to 350ºF. Place the rolls in the oven and bake until puffed and golden brown (internal temperature should read about 190ºF), about 30 minutes. Transfer pan to a cooling rack and let cool slightly before icing. In a small bowl, whisk together the confectioners' sugar, milk and vanilla extract, adding more milk or sugar to reach desired consistency. Drizzle or spread over slightly cooled rolls. Serve immediately.